Anjunadeep is a special collective in the world of dance music. It’s perfectly described in the name, as an offshoot of the massive Anjunabeats family with a special focus on the deepest and most vibe-worthy House music. Anjunadeep has paved way for names like Lane 8, Yotto, Jody Wisternoff, James Grant, Eli & Fur, Moon Boots, and so many more. This Summer, Anjunadeep has and will be bringing its most epic tour to the States to date, in the form of Anjunadeep Open Air. This Saturday will be a special treat to those residing in the Bay Area. Specifically Anjunadeep will take over the picturesque Treasure Island, situated right in the middle of the bay between San Francisco and Oakland, for a full day of dreamy House music perfection. 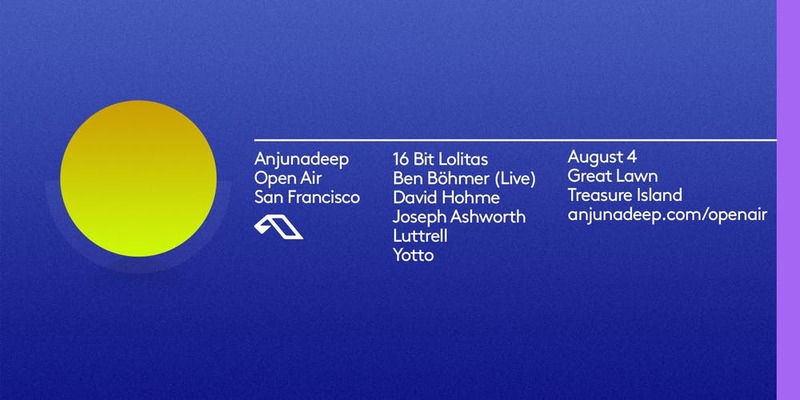 The lineup includes 16 Bit Lolitas, Ben Böhmer, David Hohme, Joseph Ashworth, Luttrell, and Yotto – a collection of veterans and newcomers to the Anjunadeep family. Having seen footage of the tour so far, most notably the Brooklyn edition where pouring rain only added to the party, I can bet this will be a day to remember. At this point tickets are sold out but if you look hard enough you’ll surely be able to grab a pair. Hope to see everyone this weekend, vibing to some of the best in the industry! Anjunadeep 06 (Mixed By James Grant & Jody Wisternoff) – OUT NOW!